“M’illumino di meno” is a symbolic initiative aimed at raising awareness on energy saving, and represents the most important communication campaign on energy saving in Italy. The slogan of the day in this poster: “the festivity of the energy saving”. I vote “I will use less light”. It was launched in February 2005 by Caterpillar, a popular current radio show on the Radio2 channel of RAI (the Italian Public Broadcasting Service) which announced the First National Day of Energy Saving. The conductors of the transmission Caterpillar as they appear in the web site of the show. This year marks therefore the ninth edition of the initiative. The name given to the day is inspired by the famous verses of the hermetic poetry “Morning” (Mattina) by Giuseppe Ungaretti, 1970 Neustadt International Prize for the literature (poetry is composed of only two words: “M’illumino d’immenso”: in English, it may be translated, with more words, in “I flood myself with light of the immense“). 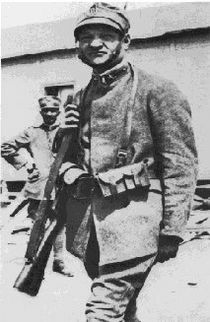 An image of Giuseppe Ungaretti soldier. 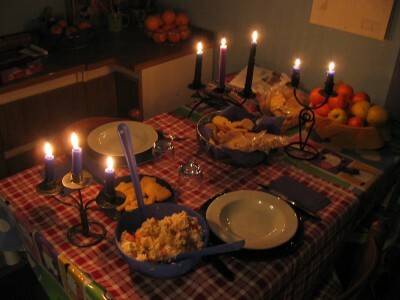 The day is organized every year around February 16. There is a reason for such choice: in fact, the February 16th, 2005, is the day when the Kyoto Protocol came into force, following the accession of Russia in November 2004. The day is not fixed because public holidays tend to be avoided. This year, the choice of the Energy Saving Day fell on Friday February 15th, and incidentally this is the day after the popular festivity of St. Valentine day. Here there is the hymn of the day (with Italian words), and in this site only the music. 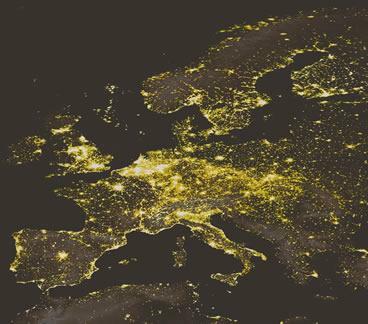 The philosophy of “M’illumino di meno” is to convince more people as possible to limit the energy consumption, back saving the biggest energy deposit available in a free way and in a short time, and has been evidenced also by several blogs and social networks. Even if there are also other initiatives connected with the day, the maximum visibility on medias and the largest participation by common people are concentrated on the Energy Saving Day, i.e. in the 15th of February 2013: in that occasion, everybody is asked for reducing at the minimum their own private energy uses during the show time, from 6pm to 7.30pm. Citizens ,companies, shop-owners, schools, restaurants, gyms and any other kind of association will be participating in their own personal way; turning off shop-windows, computers or electronic machines in laboratories, organizing candlelight dinners and so on. Initially directed only to citizens, the initiative it was met with great success and gradually went widening, involving first, at the local level, individual municipalities, then the ANCI (Association of Italian Municipalities) and subsequently also the Presidence of the Council of Ministers, earning also the patronage of the Ministry of Environment. The most incredible effect is assured by the symbolic turning off of the most important monuments and the most important city plazas, united in a sort of “energy silence”. 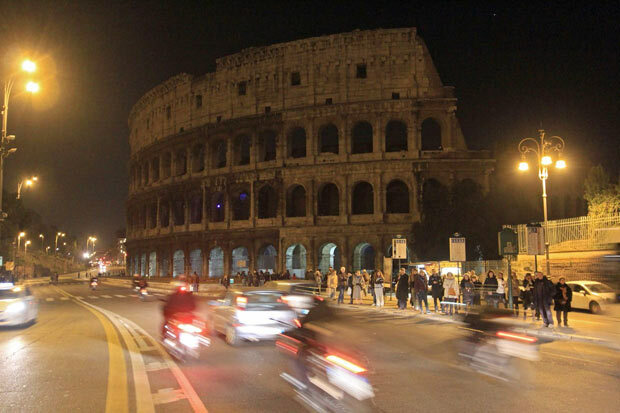 In Italy, among the most important monuments and places remained in the dark, we can mention the Duomo in Milan, the Colosseum in Rome, the Mole Antonelliana in Torino, the Arena in Verona, Piazza San Marco in Venice, as well as many other Italian squares and monuments. 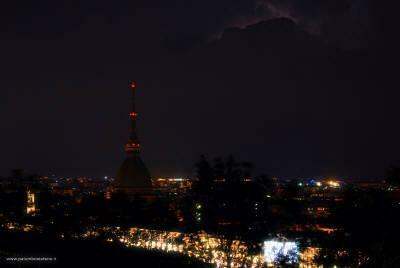 Mole Antonelliana (Torino) in dark. 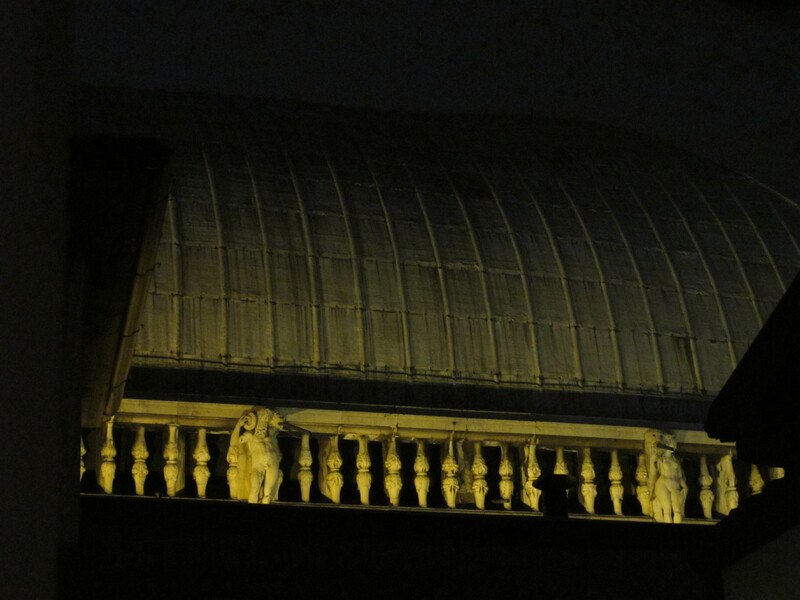 San Pietro (Vatican) in dark. In 2008, the President of the European Parliament, Hans-Gert Poettering, has endorsed the initiative, calling it “an event that has a symbolic and a tangible effect”. The initiative had some followers also abroad: sometimes, the foreigner twinned towns have been involved. Among the others, the following monuments were turned off: the Eiffel Tower in Paris, the Custom House in Dublin and the Foreign Office in London. 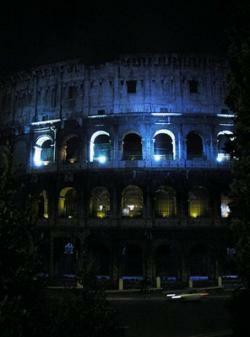 An unforgettable edition was that of 2011, coinciding with the sesquicentennial anniversary of the unification of Italy. In this edition, “M’illumino di meno” was celebrated by turning off the lights and switching on “clean” lights on an Italian flag. Although short-lived, the event is also rated in terms of actual energy savings. As reported by Terna, the company responsible for the transmission of electricity in Italy, in the minutes after the beginning of the initiative, there has been a significant decline in consumption. The need for instant energy recorded was about 300 MW less than in 2007, more than 400 MW in 2008, and about 500 MW in 2010, value representing a consumption of 8 million light bulbs. 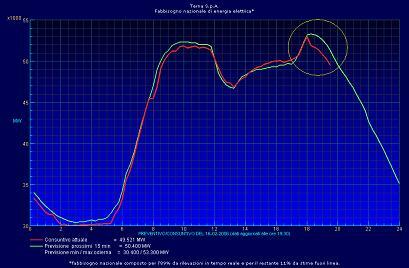 It is possible to check the success of the 2006 edition of “M’illumino di meno” using the following chart, provided by Terna and related to the consumption of energy of the day February 16, 2006, in which it is evident (circled in yellow) the collapse of the real consumption (red line) compared with that normally scheduled for 18:00 (yellow line). So, on February 15th, 2013, individuals and organizations are asked to turn off their lights and other electrical devices powered by non-renewable energy sources. At the same time, lights from renewable sources are actively encouraged to be turned on. Mayors, citizens, teachers, students, factories, shops owners and workers, are also asked to find convenient and creative ways to turn on red, white and green lights, to show how important is facing environmental causes for the whole country. The campaign is also enriched with numerous local initiatives, such as zero impact exhibitions and concerts. At present, several cities have announced their participation at the iniziative. 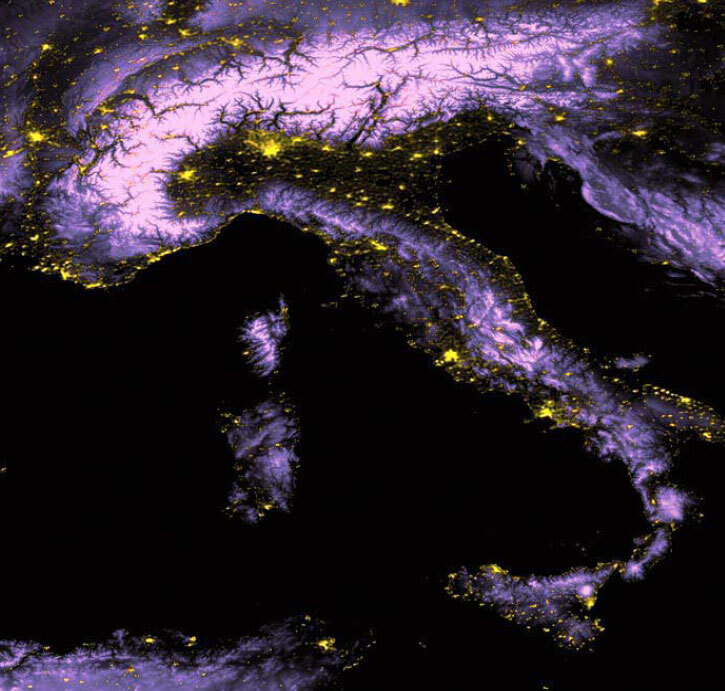 Among the others, we cite: Milan, Bologna, Florence, Torino, Bari, Padua, Agrigento, Genoa, Pisa, Matera, and many others. During the event “M’illumino di meno” of 2010, the radio program Caterpillar told about the symbolic initiative of the construction of a special photovoltaic torch who crossed, like an Olympic torch, several Italian cities and some institutions (e.g. the Vatican City and the Quirinal). The torch, built in the style of the Olympic torch, was the first in the world to be built with renewable technologies: the power supply is fully guaranteed by photovoltaic modules that allow the lighting of the “brazier” realized with high efficiency LED microprocessors controlled by random functions for a realistic simulation of the flame. There is also a module that allows the torch to switch on automatically and uninterruptedly in the presence of light without the need to activate it. This year, as usual, during the month leading to the event day, the radio program Caterpillar explained what each of us can do and how we can really change our routine energy habits in order to reduce wastes. Suggestions, hints and initiatives to emulate were told on Caterpillar radio show, by scientists and by common people. Hints explained by experts and “grandma’ remedies” has involved the audience in a thrilling ethical environment competition of good practices. I am concluding this post by reporting here the decalogue of “M’illumino di meno”, to be interpreted as good habits not only for the special day, but for every day practices. Use the car as little as possible and, if necessary, to share it with those who make the same journey. Alternatively, choose to go to the place of work using a bicycle or public transport. Pay attention to tire pressure if it is lower than 0.5 bar, the car uses 2.5% more fuel. Furthermore, using a low viscosity oil for the engine, can reduce fuel consumption by more than 2.5%. Even in car air conditioning not abuse that increases overall consumption by about 5%.